Hr displays on Samsung Washer? If you are getting the Hr error code on your Samsung washer, this means the washer has a HEATER RELAY FAILURE. This error occurs when the washer has an issue with the main control board as the heater relay is a component on the control board. It is most commonly called: Heater Relay Fail. (The heater relay itself is soldered on the main PCB electronic circuit board, So, if it goes bad, usually the complete main PCB board needs replaced.) 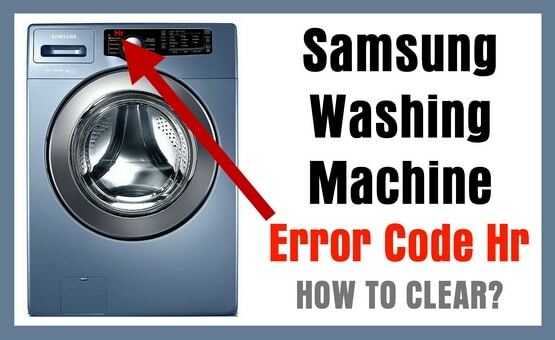 The information below will show you how to reset and or repair the Samsung washer to clear the Hr error code. 1 – The first thing to do is unplug the Samsung washing machine for 10 minutes. 2 – Plug the washer back into power after 10 minutes and run a test wash.
3 – Remove power from the washing machine and visually check the wiring connections and wire harnesses on the main control board. 4 – Check for a shorted out heater relay wire or other shorted wire(s). If you find a shorted wire, replace the wire. 5 – If still no go, remove and reconnect each wire harness (one at a time) on the main control board. NOTE: When removing wire harnesses, be sure to do them one at a time (unplug then plug back in 1 by 1) so you do not reconnect a wire harness in a wrong position. 6 – After inspecting the main control board visually and disconnecting and reconnecting all wires, run another test wash.
7 – If you STILL keep getting the “hr” error code after attempting all the above solutions… Replace the main PCB electronic control board at back of washer. –The Samsung washer main control board on front loader washers is near the rear of the machine. –The main control board is in a plastic housing to protect it from water, dirt, etc. Below are Samsung Washer Main PCB Electronic Control Boards. Please check your model number to be sure you order the correct main electronic control board. Have a question about how to fix the “hr” error code on your Samsung washer? Please let us know below and we will assist you in troubleshooting the problem. I have had this Hr code for some time. I purchased a replacement board and installed it. It worked for 6 months then came back. The part was under warranty so they sent me a new one. I installed it and I get the Hr code immediately. I’m returning this one and they will send me another one. Could it be just a poorly made board? Could there be some other issue that makes this code appear (a water issue)?